Seoul, Korea is a huge, sprawling city of high rises, with bright neon signs, delicious food, and people who never seem to sleep. It’s got the fastest Internet in the world and the most efficient subway I’ve ever used. But Seoul is a curious mix of new and old. 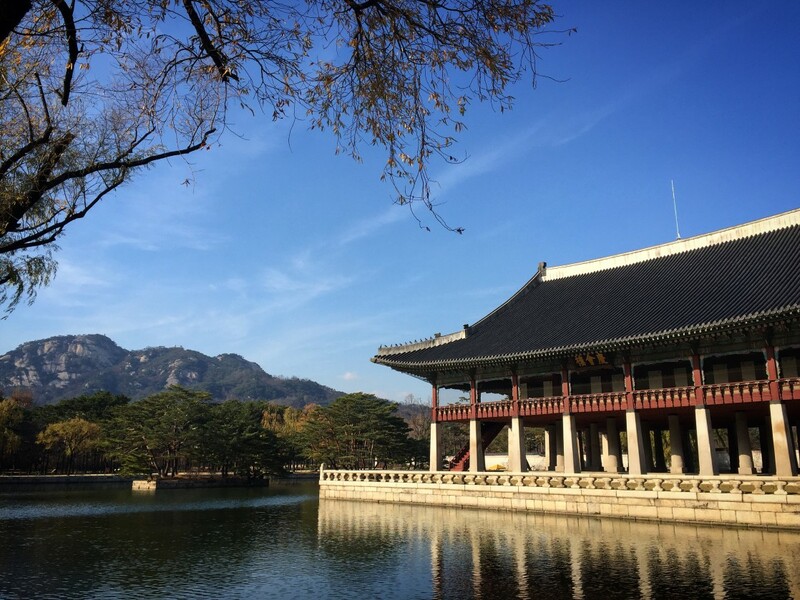 In Seoul, you can visit the gorgeous14th Century palaces of Korean royalty, and buy traditional Korean foods from street vendors in crowded open-air markets. 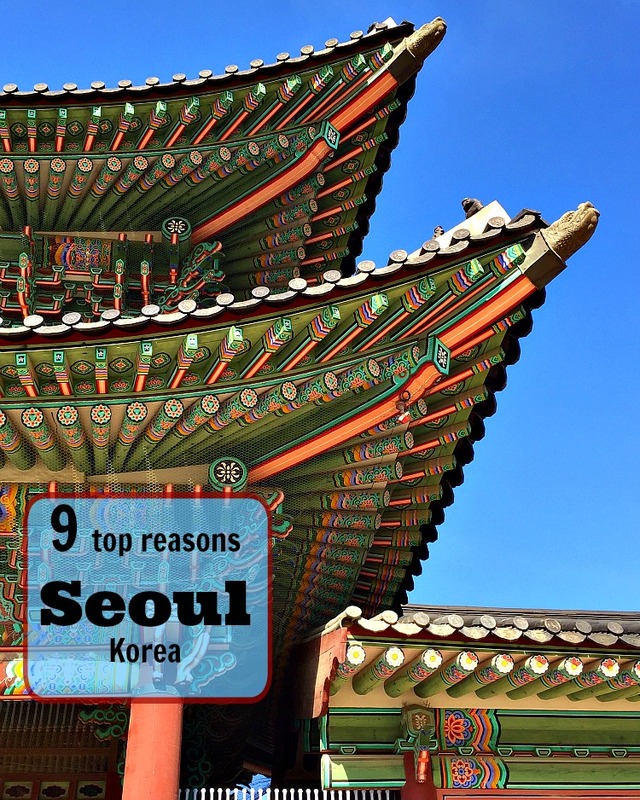 Here are my top nine reasons to visit Seoul. Parts of Seoul, Korea, feel like Times Square: crowded, bright lights, frantic commerce nearly 24 hours a day. The Hongdae neighborhood has cafes, street food, nightclubs, and street performers. Dongdaemun Market is a cluster of narrow pedestrian streets lined by one room shops and open air stalls, open til late at night. In the shopping neighborhood surrounding Dongdaemun Market, there are 30,000 (!) stores and 30 different upscale shopping malls. One multi-story mall stays open until 5 a.m.. Throughout the Dongdaemun neighborhood, motorcycle delivery men weave through traffic, each one precariously balancing piles of goods that tower over the driver’s head. Seoul wasn’t always this rollicking party of non-stop commerce. Korea’s economy exploded in the 1960’s. Almost every building in Seoul was built since then. From our hotel window, we could see 9 construction cranes working on new buildings. Korean food has lots of fresh vegetables, a variety of seafood, sticky rice, steaming broths, barbecued meat, kim chi and other pickled vegetables – it’s delicious. There are tons of restaurants where you can easily get a sit down meal for 4 for less than $40. Street vendors cost much less – and are hugely popular. While we loved traditional Korean food, who knew Seoul would have excellent French pastry? From the extravagant display of pastries at the breakfast buffet at JW Marriott Hotel to the popular chain store Paris Baguette, which smells heavenly, Koreans produce great French pastry. (Paris Baguette even opened a branch in Paris – the chain is that good.) Korean Air even serves freshly baked warm croissants – more about that here. The gorgeously painted buildings of the Gyeongbokgung Palace, originally built in 1394, are like giant wooden sculptures, many elaborately painted in red, green, and other bright colors. This palace of the Korean dynasty that ruled from 1392 – 1910 is a cluster of buildings, gardens, ponds, all behind brightly colored gates. The ponds are like reflecting pools. The King’s throne room is 3 stories high, in bright colors that were striking against a blue sky. If you visit the Changdeokgung Palace in spring, summer, or fall, be sure to see the Secret Garden. We visited in winter, so skipped the garden and just explored the wooden palace buildings, a UNESCO World Heritage site. The paint is more faded here than at Gyeongbokgung, but the reflecting ponds and worn green doors are just as lovely. A surprise is the Western furniture in the Palace. 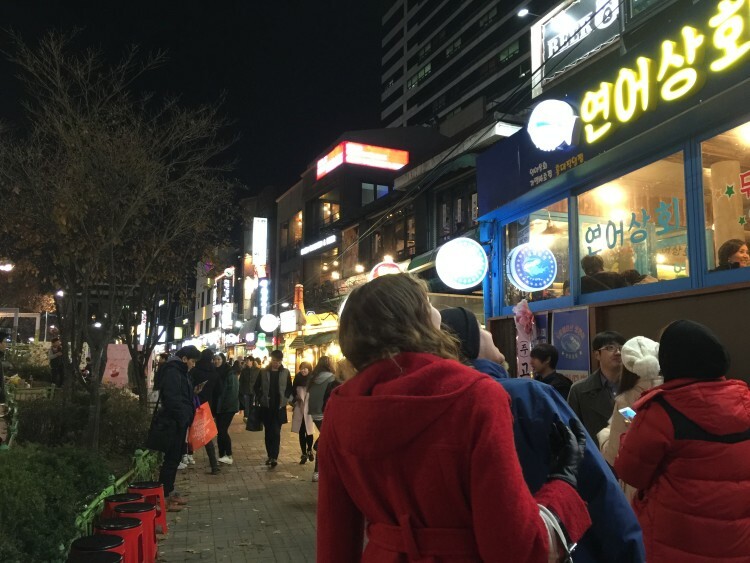 We were surprised – and grateful – that many people spoke English in the touristed neighborhoods of Seoul. Menus, store signs, museum explanations, many street signs, and subway ticket machines are in English, so it is easy to get around without Korean. 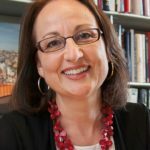 Our daughter is college in Seoul and speaks Korean, but we were comfortable exploring even when she couldn’t be with us. Seoul has a clean, fast subway system that goes everywhere – and it’s cheap. Computers sell tickets in English and signs are in English, so it is easy to use. If you have a problem, there to help you are friendly people with bright pink sashes that read “May I Help You” – in English. Commerce is king in Seoul, so each subway stop we visited had plenty of stores. The subway is also fun for people watching. Young people in Seoul are elegant, seemingly taking cues from both Paris and Tokyo. Not a baggy jean in sight. If you have a hankering for inexpensive clothes, check out Pyounghwa Clothing Market. It is a multi-story building with hundreds of clothing stores, each a single stall about 10 feet wide. The Korean attitude toward trademarks is…casual. What looks like a Ralph Lauren polo rider is on second glance a jousting knight. North Face transmogrifies into North Place. Lots of T-shirts with random English words. Shoppers flock here from morning til the wee hours to buy inexpensive clothes for men, women, and children, including traditional Korean dresses. Internet in Seoul is the fastest in the world. Even on subways, people are glued to their phones. At an upscale department store, to entertain you while waiting for an elevator, a contraption on a wall lets you take a photo, edit it with goofy hats and mustaches, post it on Facebook or email it, all before the elevator comes. The National Museum of Korea is free, and you could visit just to experience the building’s sleek modern design. But thoughtful descriptions in English make the Korean paintings, sculpture, and other exhibits accessible. At the National Palace Museum (also free), kids might enjoy seeing actual cars used by Korean royalty, a replica of the throne room, or any of the thousands of artifacts. Both museums did a great job of using animations inspired by ancient paintings to bring the exhibits to life. When dramatically lit at night, the brand new Dongadeum Design Center is an architectural marvel that doubles as a cool entrance to a subway stop. During the day, this strange donut shaped metal building looks like a space ship has landed in the middle of Seoul. It opened in 2014 is working out the kinks on how to house rotating exhibits, performances, and a café. Exhibits individually priced. 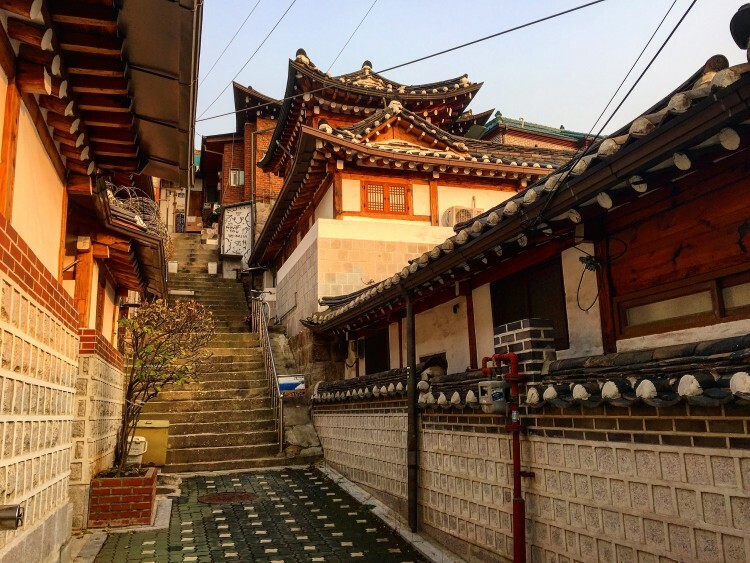 Visit this Seoul neighborhood to see traditional Korean wooden houses on steep skinny streets, all now surrounded by high rises. You can shop in small crafts stores or stop in a coffee shop or restaurant housed in the traditional wooden buildings. This is a touristy but enjoyable way to get a sense of pre-high rise Seoul. Seoul is a fascinating mix of ancient and new. 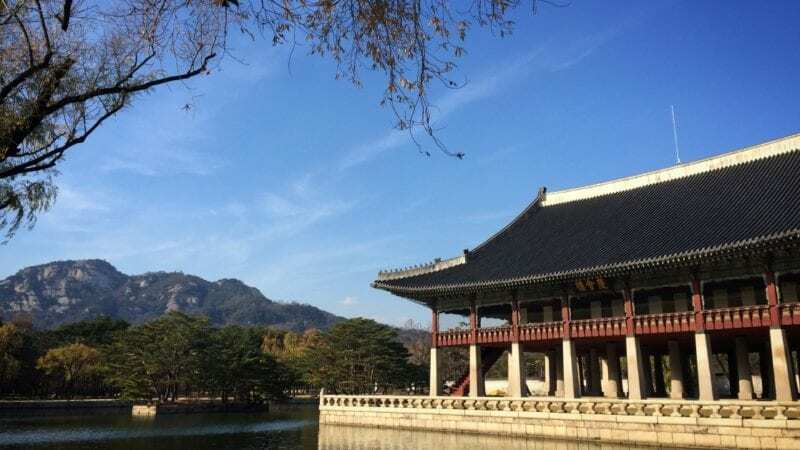 We traveled there from Philadelphia to visit our daughter on her study abroad program and, while we likely wouldn’t have visited Seoul otherwise, I’m so glad we ventured out of our comfort zone and got to explore it with her. For a taste of Korea closer to home, try visiting Korean Way, a street in New York. Have you ever visited a city that never sleeps? Tell us about it in the comments.